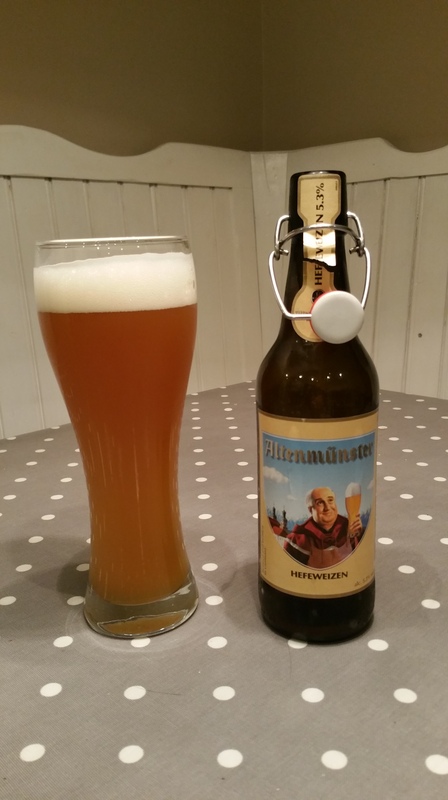 This time around at Aldi I found some of this Altenmunster Wheat Beer…and it’s in a swing-top bottle WITH A LABEL THAT COMES OFF EASILY: you brewers just don’t realise how much that means to us home-brewers. Some brewers think that home-brewers are spoiling their sales. Complete bunkum – where else would we get our inspiration and a vast supply of bottles for us to put our beer into? The Altenmunster bottles are so good that I’d happily a couple of cases…and it’s also a happy coincidence that it’s a very tasty beer too! 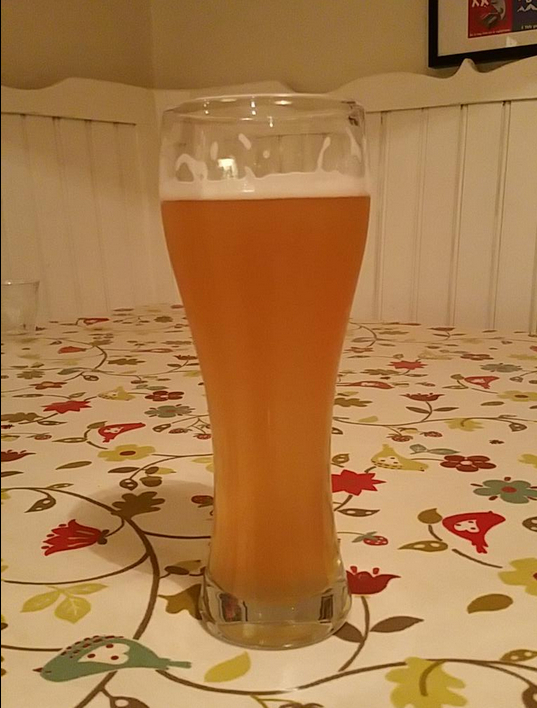 Altenmunster Wheat looks the part, it’s a nice example of the style with a lovely thick, unctuous and foamy head. The aroma is lovely fresh and bready, with the balance slightly tipped towards the clove than the banana; and it’s quite delightful. Taste-wise, it’s beautifully refreshing with a very slightly tart edge. The mouthfeel is solid and creamy with good light wheaty maltiness. It’s a very fine example of the style. As mentioned above, I’d buy this regularly…but alas and alack, Aldi only carried Altenmunster briefly for a few weeks before it abruptly stopped. What is it with me and wheat beers? I like them, but they seem to want to conspire against me when I make them. This time around I got the carbonation pretty much how I wanted it, the mouthful is generous and creamy and the yeast brought forth lashes of banana and bubblegum. Well it’s a little light on the bitterness…so it’s lovely in taste but doesn’t have that subtle bitter edge that should really set it off and balance the sweetness out a bit. And the head. Oh good God, the head…It has a really nice head to start off with…and then it collapses, spectacularly, to leave a really odd smattering of very dense foam islands…a bit like broken cloud on a summer’s day…so Christ alone knows what happened there. The next one will be great, I’m sure. I might also do it with WLP300 – not because it’s better than the Mangrove Jack’s yeast, but because it’s just plain mental – and I like that in a yeast! I know the tasting notes for this one have been a long time coming; but the kitchen is in uproar, the heating’s all up the spout and time just isn’t making itself very available these days. Because the temperature where this beer is being stored is so cold, we have the option to drink it with or without the yeast (it’s that flocculent in these coolish temperatures) – so we can have hefeweizen or kristallweizen. 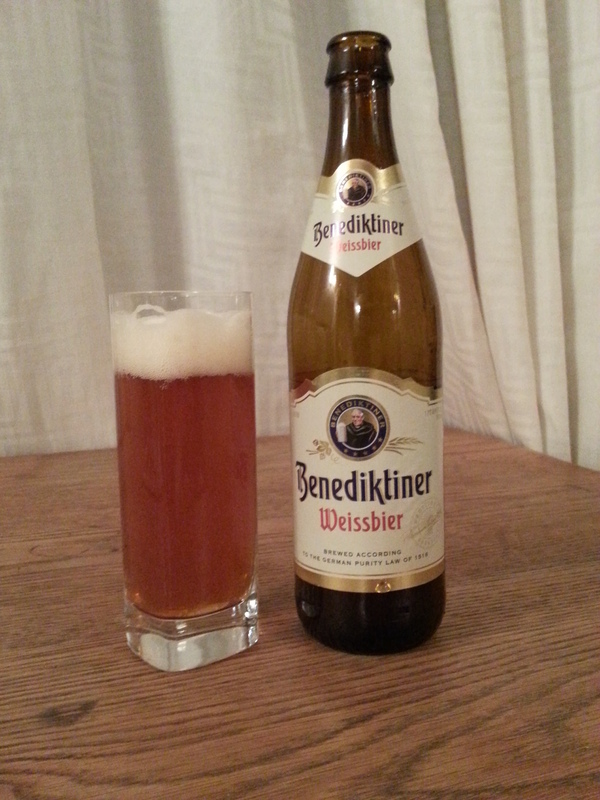 I prefer my wheats “mit hefe” so a pour and a quick twirl of bottle brings the cloudiness up nice. 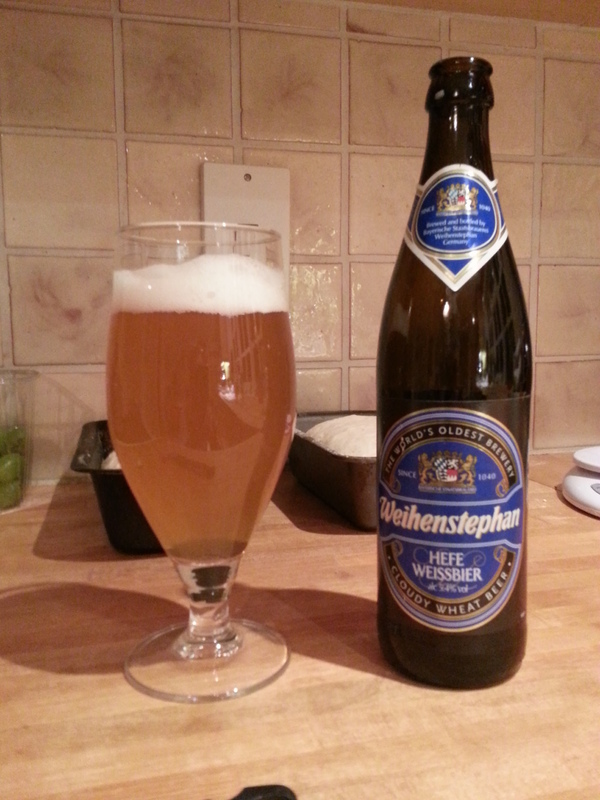 Colour-wise, I’m happy: it’s got that lovely wheat beer luminosity that I really enjoy seeing. The aroma is smack half-way between clovey-spiciness and fruity-banana-ishness. I would have preferred a tad more fruit, so next time I’ll be fermenting a whole load warmer to really encourage the banana notes. Taste-wise it’s good. Not amazing, but good enough. I’m happy enough with it as my first wheat, it’s complex and tastes about right and has a nice enough alcohol hit, but it hasn’t got that wow factor that I was really after. Next time I’ll make sure that the mash goes better and ferment it just that little bit warmer! God, I love wheat beers. 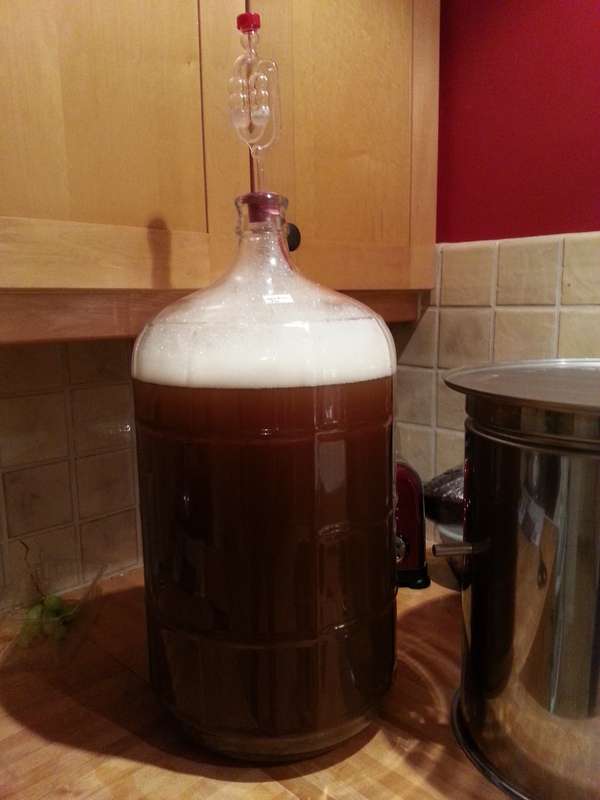 I didn’t ever think I would, but I do – so much so, that I decided to have a bash at brewing one up yesterday evening. That all looks quite simple doesn’t it? Well it was, sort of…until about two minutes into the mashing I heard the sounds of trickling water from inside the BM. Lifting the lid revealed wort fountains and serious channeling through the mash! In a panic I phoned Greg at BrewUK for advice, he said that It’s due to the wheat malt being huskless and the pils malt – being crushed quite a bit finer than Maris Otter or Belgian pale – means that the pressure builds up and eventually forces it’s way through the mash into these oh-so beautiful little fountains. Greg asked if I had any rice hulls to hand to loosen up the mash a bit – which of course I hadn’t. I said that I figured that the awesome power of the BM would negate the need for mash fillers…apparently not. To his eternal credit, Greg offered to replace my ingredients should I have to dump everything, but I decided to go for a serious bit of stirring and mash agitation every 10 or so minutes – 30 minutes later and this seemed to have done the trick. The rest of the mash went off fairly uneventfully apart from a little fountain during the last ten minutes in the mash-out schedule. 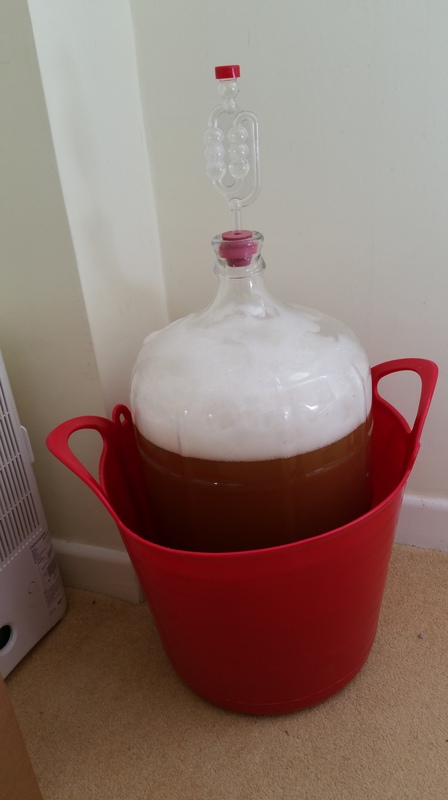 After a 4 litre sparge and a little over a 60 minute boil I ended up with 22 litres in the carboy at 1051 – which was pretty much where I wanted to be and not bad considering it’s my first outing with wheat. UPDATE: Pitched WLP300 at 10.30pm last night and just got called at 10am by Eve claiming “That beer is now stinking the house out“. At least it’s working! UPDATE No. 2: Got home at 6pm to find about half a litre of beer and foam in the bucket that the carboy is sat in and a very strong bready/malty aroma pervading the house. 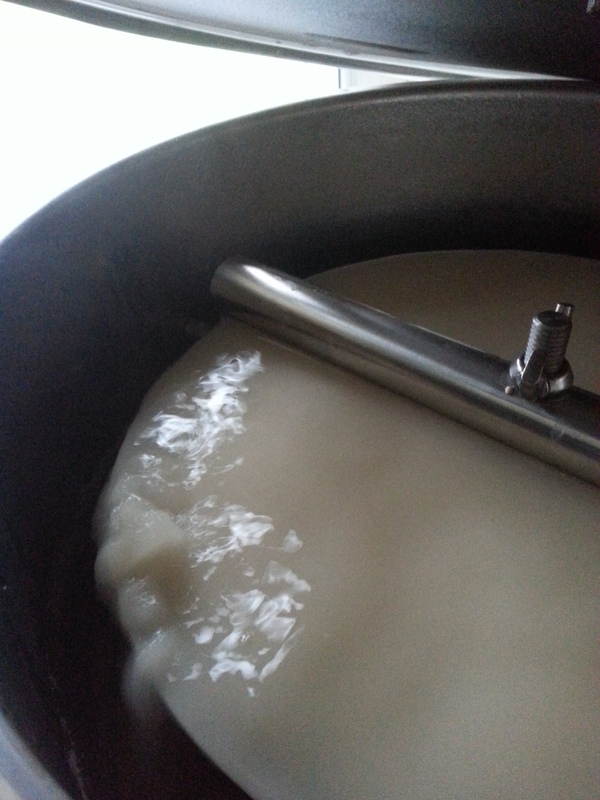 Airlock still foaming like mad. That’s a piss-poor title and no mistake…sorry about that…. This time it’s another wheat beer, and it’s fair to say that it’s a lot darker than what I’ve experienced so far in a Weiss, but that makes it all the more exciting.